Ok. This is stretching it a bit, but the only proper romantic film I really like, I already chose for Day 14. They did say this film was a RomComZom (Romantic Comedy…. with Zombies). Fantastic action film. Ed Harris brilliantly plays a rogue US Marine General who takes hostages on Alcatraz island in San Fransisco Bay while pointing poison gas missiles at the city. 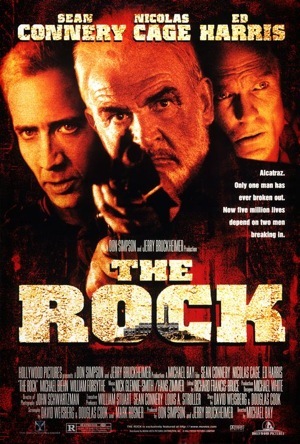 The FBI director (the late great John Spencer) brings in their top chemical weapons expert Stanley Goodspeed (Nic Cage) and the only man to ever have escaped from Alcatraz, John Mason (Sir Sean Connery) to go along with a Navy SEAL team to release the hostages and secure the missiles. Action brilliance ensues. This is probably my favourite Cage performance and Sir Sean excels as an aged James Bond well. With three such strong leads, this film could scarcely put a foot wrong and it doesn’t. 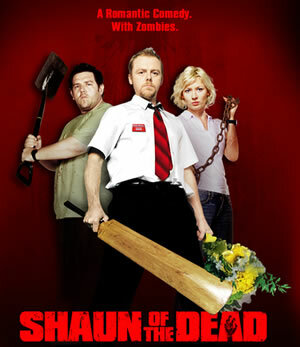 This movie is a perfect example of how to do a spoof well. Pay homage to the original, show respect for the original. It is possible to do this and spoof it at the same time as this film shows. 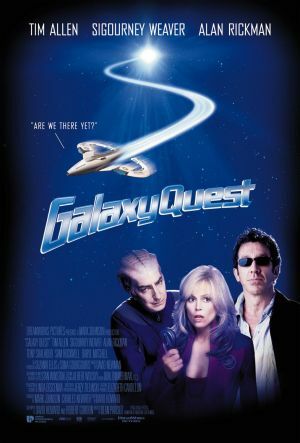 If you are a Star Trek fan, or have any knowledge of the show at all, this movie is well worth a watch or 20. It’s got Tim Allen in his best performance ever. But even better, Sigourney Weaver and Alan Rickman! All in one film! This is the most fantastic movie and a true definition of Drama. 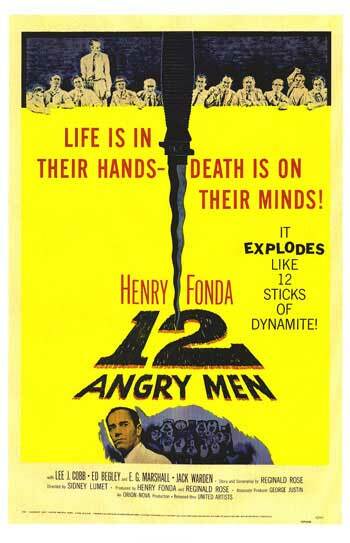 12 men, 1 room, an hour and a half of tense thrilling drama as Henry Fonda plays the only dissenting jurer in a seemingly open and shut murder case as he tries to bring round the others to the idea of reasonable doubt. Not a special effect in sight but seriously one of the best films ever made. Again. I couldn’t really think of anything for what today’s category was supposed to be (film you used to like but now hate). So I decided to split the upcoming sci-fi fantasy category and do sci-fi now and fantasy then. I promise this is the last time I’ll change the category… probably. Anyway, this is my favourite sci-fi movie (not counting those already mentioned for other categories). 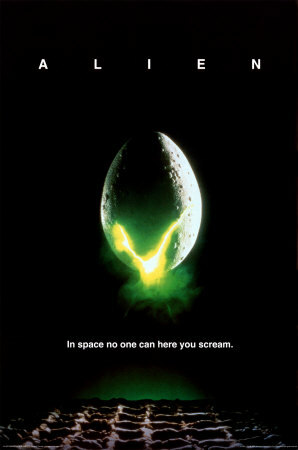 A brilliant sci-fi suspense horror/thriller that keeps you guessing who from it’s fantastic ensemble cast will survive. Well, I couldn’t for the life of me think of a film that depicts my life, so I decided to change today’s category. There’s a favourite Action film category coming up that would cover war films but I really think they are deserving of their own. 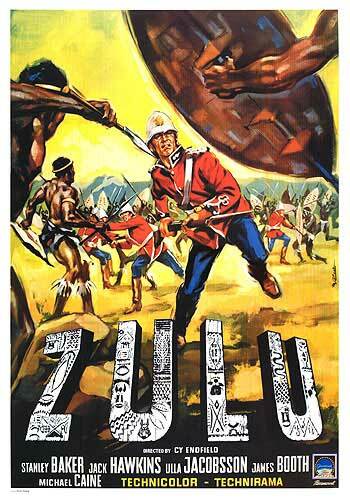 This 1964 film tells the story of the defence of Rourke’s Drift in the Anglo-Zulu war of 1879. Rourke’s Drift was a tiny mission station in present day South Africa consisting of a church, hospital and store-house with a small contingent of soldiers stationed at it. Around 150 men of the 2nd Batallion 24th Regiment of Foot under the command of Lieutenant Bromhead (Michael Caine in his first major role) receive word from a messenger that the rest of their regiment consisting of almost 2000 men has been slaughtered at the Battle of Isandlwana by a force of 20,000 Zulu warriors, 5,000 of whom are now heading for them. Under orders to hold the station at all costs, Bromhead and the other officer on site, Lt. Chard of the Royal Engineers (Stanley Baker) prepare their men to defend. 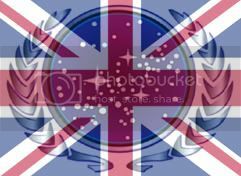 What follows has gone down in the military history of not only Britain but the Zulu nation as well. The film is expertly directed by Cy Enfield and recieved the full support of the Zulus during production. The Zulus in the film are all played by actual Zulus and the Zulu King by his own great-grandson. Along with fantastic performances by the two leads, Nigel Green shines as the unflappable Colour Sergeant Bourne and Richard Burton narrates at the beginning and end. Well, it’s a romantic film so that automatically makes it unlikely that I’d like it but this film of two parallel time lines is just so good. It’s a very clever film with some brilliant writing and great performances from the leads Gwyneth Paltrow and John Hannah.